India's exports have been on a major slide. You could blame it on global slowdown or plunge in oil prices. 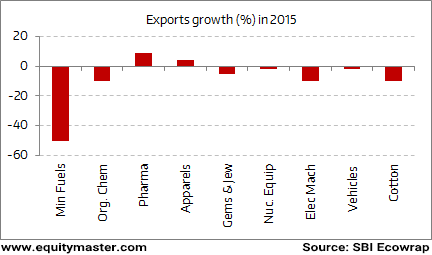 Export performance of India for top ten segments during calendar year 2015 has been a disappointing one. However, the Pharmaceutical sector, which is an important contributor to India's exports, stood out in terms of export performance. The US is the prime destination for Indian generic drugs. Geographies such as Europe and emerging markets like Brazil, Mexico, Russia, South Africa and South-East Asia regions too are important buyers of Indian drugs. But majority of these geographies posed critical challenges for the pharma companies in the year gone by. If crackdowns by the US FDA were not enough, slowdown in emerging markets. And currency risks have added to the woes. But despite the headwinds the pharma pack could manage growth in exports. So how should investors benefit from the opportunity in pharma space? The India Letter team has an answer. Recently, the team recommended a stock which is a leading supplier for generics in the global markets over several years now. And they have reasons to believe that the best pharma companies will not lose their edge anytime soon. The Indian companies have been under pressure off late to get their acts together. The crackdowns by US FDA is something that Indian companies need to adapt to. This is particularly true, given the increasing frequency of inspections occurring at their manufacturing facilities. Traditionally the US FDA used to visit the plants every two years. This frequency has now gone up. Now, the regulators tend to visit the facilities every six months. But we believe this concern is not long term in nature. India has the largest number of FDA-approved plants outside of the US. With abilities to meet US FDA norms, stronger R&D and big acquisitions in the US, the tailwinds favouring long term prospects of Indian pharma remain intact. Equitymaster requests your view! Post a comment on "Pharma Exports Fare Comparatively Better". Click here!